Sales categories are key performance indicators (KPIs), or ways to evaluate the success of your company. 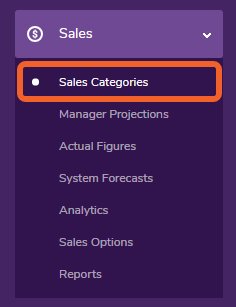 Sales categories can be used for things like making an employee schedule, monitoring the labor costs of salaried employees, and even projecting your gross sales. TimeForge offers a very customizable “Sales” feature that helps you stay on top of your business’s metrics. If you’re integrated with a POS system, we’ll likely pull these sales categories from that system. However, if you need any assistance setting up sales categories, please don’t hesitate to contact us. 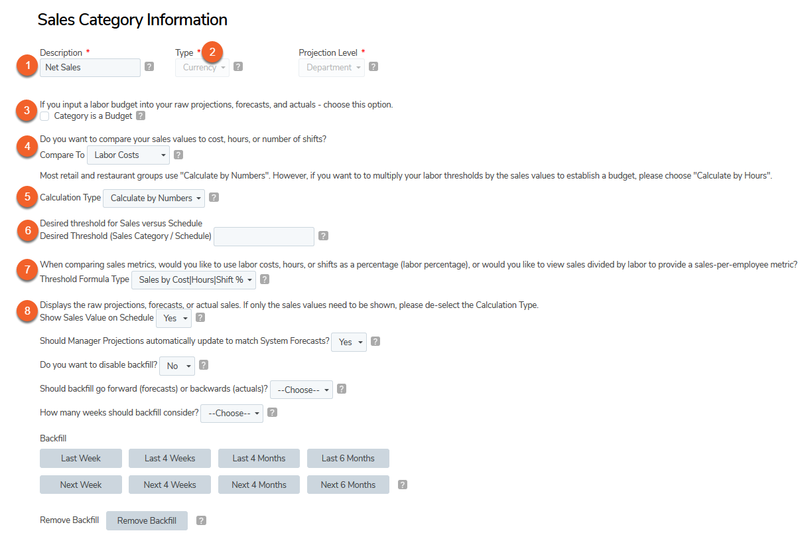 After configuring your “Sales Categories,” you’ll likely want to consider setting up ShiftBuilder rules so that you can start generating schedules with the ShiftBuilder based on your Sales Projections. At the Location level, open the Sales tab and select Sales Categories. Select the category you would like to configure. If you need to add a new Sales Category and you have more than one location, you will need to go to the Corporate level. Description: The Sales Category Description is simply the name of the Sales Category. This was determined when the Sales Category was created. Category as a budget: How do you want Sales to be Compared to Labor? If this should be based on a target threshold (like 13%), do not check this box. If sales should be directly compared to labor, do check this box. Compare To: Most customers want to compare their sales to their labor costs (a dollar-to-dollar comparison). However, we also support comparing sales to labor hours (Sales Per Man-Hour), or comparing sales to scheduled shifts. Calculation Type: Most customers want to calculate by “Numbers”, but we enable calculation by “Hours” if you need it. You should calculate by “Numbers” if you want your Desired Threshold to be the “magic number” that your schedules need to meet. That is, if your scheduled cost (or hours, or shifts, depending on item 4) need to be under 13%, then “Numbers” is for you. However, you should calculate by “Hours” if you want to enter a productivity budget that is calculated by multiplying your sales with your Desired Threshold. In other words, if your schedules need to be under $300 (or under 300 hours, or under 300 shifts, depending on what you selected in item 4), then “Hours” is for you. Desired Threshold: If you do not want a category as a budget (item 3), and you are not using department-level or position-level thresholds, enter a “Desired Threshold” like thirteen percent (type in 13) – or whatever is appropriate for your business based your KPIs. Threshold Formula Type: Cost|Hours|Shift by Sales % is the default formula, and most restaurants will use this default formula. It’s for comparing whatever was selected in item 4 – the labor cost, labor hours, or number of shifts – to the sales, and displaying that as a percentage. Cost|Hours|Shift by Sales is for comparing whatever was selected in item 4 – the labor cost, labor hours, or number of shifts – to the sales, and displaying that as a decimal. Sales by Cost|Hours|Shift can be used for SPMH (Sales Per Man-Hour), and most retailers will use this formula. It is for comparing sales to whatever was selected in 4 – labor hours for SPMH – and displaying that as a decimal. Similarly, Sales by Cost|Hours|Shift % is for comparing sales to whatever was selected in 4 – labor hours for SPMH – and displaying that as a percentage. Show Sales Value on Schedule: If you want to display the sales value (like $1,500) on your Schedule, select Yes. If you want to display the Sales-to-Labor % on your Schedule, select No. Under the Forecasting Configuration section, you can choose a forecasting threshold and select which forecasting algorithms to use. The TimeForge Algorithms are the default and recommended. TimeForge Algorithm: This determines whether you’d like to use the default TimeForge Algorithms that our Sales Forecaster runs. Because of their accuracy, the default TimeForge algorithms are used most often and usually recommended. You can input your own information and and create a forecast based on weighted averages. Usually, you’ll have very specific numbers and be looking for a specific date/day of the week to forecast. This option determines whether you are interested in calculated the date for this forecast as either a date (the 1st) or a day(Friday). Choose how many days in the future that TimeForge should look at to make a forecast. This number can either be in days or weeks. Choose how many days in the past that TimeForge should look at to make a forecast. This number can either be in days or weeks. You can determine a set number of days or weeks in the past that TimeForge should look at to make a forecast. These options determine how heavily each average is weighted. So, if you want “the previous foretasted days” to be weighted more than the others, simply type in a higher number in the corresponding box. These four numbers must equal 100%. Forecasting your sales using a Weighted Average Variance is similar to calculating with Weighted Averages, except this formula actually lets you eliminate random outliers from being included in the calculations. See our step-by-step guide on forecasting your sales with this method.